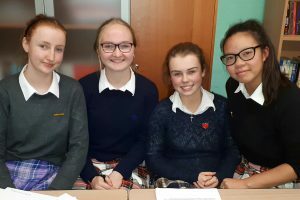 The English Department in The Teresian School has been actively involved in debating throughout the years. We have participated in Concern debating, Mace debating, MUN, EYP and the UCD Irish Federation of University Women debates. Debating skills are essential to public life. When the world’s first universities were established, three skills were considered essential for leadership and promotion of the best ideas: grammar, logic, and rhetoric—what we now know as reading, writing, and speaking. Today in the 21st century, the ability to create, present, and evaluate ideas remains essential to democracy and commerce in modern societies. Debating fosters these traits. Evidence indicates that debating allows students to explore and gain understanding of alternative viewpoints. Students develop skills in research, critical thinking, organisation, persuasion and communication. 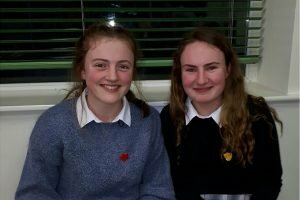 Concern debating – The Concern Debates is Concern Worldwide’s flagship schools activity. 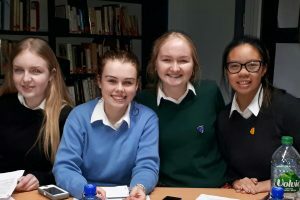 The programme gives students the opportunity to learn skills in research, critical thinking, public speaking and debate, and tackle some of the most important issues facing the world today. MUN – Model United Nations – also known as Model UN or MUN, is an educational simulation and/or academic activity in which students can learn about diplomacy, international relations, and the United Nations. EYP – European Youth Parliament – Students engage in both academic discussions and social situations, thus broadening their experiences. The same applies to political knowledge and debating skills, which are both fostered within EYP. It is a unique opportunity for learning and self-development for young students. EYP wants to promote non-formal learning in the field of political education.